Patients with CN schwannomas can present with loss of function of the affected nerve, but they can also be asymptomatic. In these latter patients, the lesion may be incidentally discovered on computed tomography (CT) scans or MRIs obtained for reasons other than the evaluation of a schwannoma. Schwannomas are slow-growing, benign, encapsulated neoplasms that arise from the nerve sheath and consist of Schwann cells in a collagenous matrix. [8, 3] These lesions account for 6-8% of intracranial neoplasm; vestibular schwannomas are the most common CN schwannomas, followed by trigeminal [9, 10, 11] and facial schwannomas and then glossopharyngeal, vagus, and spinal accessory nerve schwannomas. A study of patients undergoing MRI for indications other than the evaluation of schwannoma revealed an estimated prevalence of 0.07%. Varying growth patterns in schwannomas are described as Antoni type A neurilemoma and type B neurilemoma. Although type A tissue has elongated spindle cells arranged in irregular streams and is compact in nature, type B tissue has a looser organization, often with cystic spaces intermixed within the tissue. The cystic spaces can result in high signal intensity on T2-weighted MRIs. Schwannomas involving the oculomotor, trochlear, abducens, and hypoglossal nerves are rare. See the images below. CT evaluation may be limited primarily to the assessment of bony changes in the skull base. On contrast-enhanced CT a schwannoma displays heterogeneous enhancement  Artifact from the skull base limits the soft-tissue resolution of CT scans, particularly in small lesions. Plain radiography has no role in the evaluation of the lesions. Contrast-enhanced T1-weighted magnetic resonance image at the level of the internal auditory canal shows a strongly enhancing cisternal vestibular schwannoma (arrow) that compresses the adjacent pons and cerebellum and distorts the fourth ventricle. 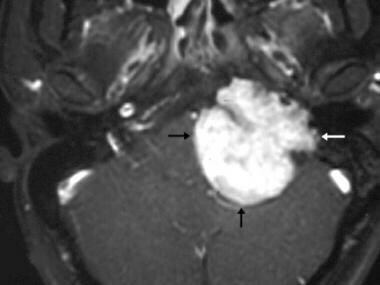 Contrast-enhanced T1-weighted axial magnetic resonance image through the internal auditory canal shows a heterogeneously enhancing intracanalicular-cisternal vestibular schwannoma (white arrow). 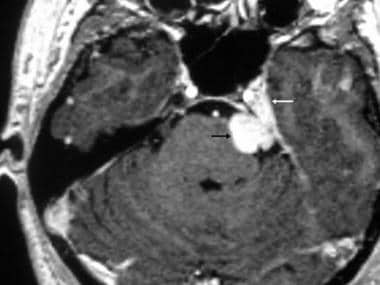 Anterior to the schwannoma, a tumor-related cyst is depicted (black arrow). Intracanalicular vestibular schwannoma. Axial constructive interference in the steady state (CISS) magnetic resonance image shows a 3-mm mass (arrow) in the internal auditory canal as a filling defect in the bright cerebrospinal fluid. Vestibular schwannoma. Axial contrast-enhanced T1-weighted magnetic resonance image confirms an intracanalicular mass (arrow). Bilateral vestibular schwannomas. 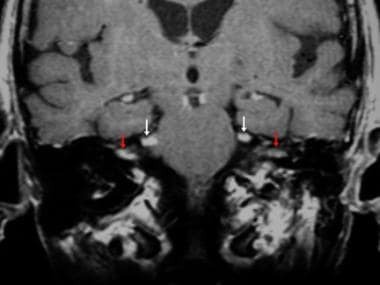 Axial contrast-enhanced T1-weighted magnetic resonance image reveals bilateral vestibular schwannomas (arrows), which are diagnostic of neurofibromatosis type 2. Motor neurons of the oculomotor nerve (ie, CN III) leave the midbrain at the level of the tegmentum and emerge in the interpeduncular cistern. Here, it passes between the posterior cerebral artery (PCA) above) and the superior cerebellar artery (SCA) below, and it turns anteriorly to enter the cavernous sinus. In the cavernous sinus, the oculomotor nerve courses along the lateral wall; it is the most superior of all the nerves in the sinus. The nerve enters the orbit via the superior orbital fissure and then splits into superior and inferior divisions. From the trochlear nucleus in the midbrain, fibers of the trochlear nerve (ie, CN IV) cross the midline dorsal to the cerebral aqueduct and exit the midbrain dorsally. From here, the fibers run around the midbrain to the ventral surface. Like the oculomotor nerve, the trochlear nerve also courses between the PCA and SCA and along the lateral wall of the cavernous sinus. It enters the orbit at the superior orbital fissure. The trigeminal nerve (ie, CN V) exits the brainstem at the level of the mid pons, and its 3 divisions—the ophthalmic (CN V1), maxillary (CN V2), and mandibular (CN V3) branches—together proceed anteriorly toward the trigeminal ganglion in the Meckel cave, as shown in the image below. From here, the mandibular division exits inferiorly via the foramen ovale. The maxillary and ophthalmic divisions continue anteriorly along the lateral aspect of the cavernous sinus. Eventually, the ophthalmic division enters the orbit via the superior orbital fissure, while the maxillary division exits the cranial vault through the foramen rotundum. Lymphoma of the Meckel cave. Coronal contrast-enhanced T1-weighted magnetic resonance image shows an enhancing mass in the Meckel cave on the right (white arrow). The left Meckel cave is without tumor (black arrow). 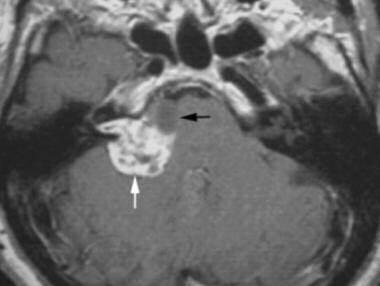 Lymphomatous meningitis can mimic a cranial nerve schwannoma. The abducens nerve (ie, CN VI) exits the brainstem ventrally at the level of the junction of the pons and medullary pyramid and courses anterolaterally toward the dorsum sellae, passing over the petrous apex where it makes a sharp turn to enter the cavernous sinus. In the sinus, the abducens nerve is medial to CN IV, CN V1, and CN V2. Along with the oculomotor and trochlear nerves, the abducens nerve also enters the orbit via the superior orbital fissure, then enters the deep surface of the lateral rectus muscle. The facial nerve enters the labyrinth (labyrinthine segment), courses anteriorly in the temporal bone to the geniculate ganglion, turns posteriorly to pass beneath the lateral semicircular canal (tympanic segment) and then inferiorly to course through the mastoid (vertical segment), and exits the temporal bone via the stylomastoid foramen. Finally, the facial nerve courses within the parotid gland (parotid segment) before branching. The glossopharyngeal (ie, CN IX), vagus (ie, CN X), and accessory (ie, CN XI) nerves emerge cranial to caudal, in that order, from the ventral medulla, lateral to the medullary olive. From there, they course toward the jugular foramen and exit the skull base at the jugular foramen. The glossopharyngeal nerve is located in the pars nervosa of the jugular foramen, and the vagus and accessory nerves are located within the more posterior pars vascularis. The hypoglossal nerve (CN XII) is formed by the fusion of multiple rootlets that emerge from the ventrolateral sulcus between the medullary olive and pyramid. The nerve exits the cranial vault via the hypoglossal canal, then lies medial to CN IX, CN X, and CN XI. The differential diagnosis varies with the location, but meningiomas can occur in similar regions and have similar imaging appearances as schwannomas. The differing growth patterns, as well as the dural tail and associated hyperostosis that can be seen with meningiomas, are often helpful differentiating factors. See the image below. 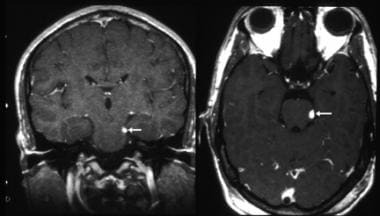 Cerebellopontine angle meningioma. Axial contrast-enhanced T1-weighted magnetic resonance image through the cerebellopontine angle shows a large cisternal mass. The intracanalicular component (white arrow) can mimic a vestibular schwannoma, although the broad-based dural attachment (red arrows) is more consistent with a meningioma. Cerebrospinal fluid (CSF) spread of metastatic disease or lymphoma can appear as a focal CN mass. 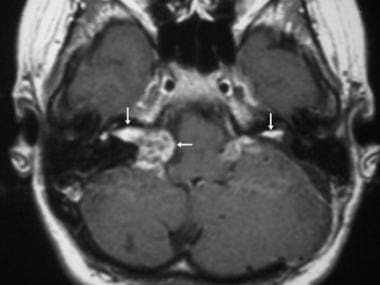 In patients with carcinomatous meningitis and lymphoma, focal metastatic masses can involve the cranial nerves and mimic a schwannoma. See the images below. Carcinomatous meningitis. 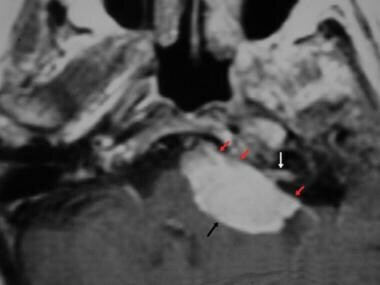 Coronal contrast-enhanced T1-weighted magnetic resonance image reveals bilateral cranial nerve V (white arrows) and cranial nerve VIII masses (red arrows). The patient had lung cancer with cerebrospinal fluid spread manifesting as multiple cranial nerve masses. Neuritis (ie, inflammation of a nerve) can be confused with a mass. See the images below. Facial neuritis. 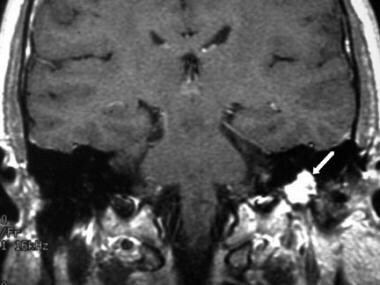 Axial contrast-enhanced T1-weighted magnetic resonance image shows enhancement of the distal intracanalicular, labyrinthine, and geniculate, segments (arrow) of cranial nerve VII. Facial neuritis. Coronal contrast-enhanced T1-weighted magnetic resonance image shows enhancement of the labyrinthine and tympanic segments of cranial nerve VII (arrow). NF2 is one of the phacomatoses characterized by multiple intracranial schwannomas, meningiomas, and ependymomas. Bilateral vestibular schwannomas are diagnostic of this entity, but patients can have schwannomas involving any CN (CN III-XIII). See the image below. Other conditions to be considered include glomus tumors of the head and Neck and NF1. Failure to perform MRI when CN tumors are suggested is a concern. In particular, CT scans of the brain are inadequate for evaluating CNs, and the reliance of negative CT findings to exclude a CN lesion may lead to liability. No role exists for plain radiographic evaluation of schwannomas. Findings on conventional radiographs are nonspecific, and typically, lesions are visualized on plain radiographs only when they are large. Bone-window images can demonstrate remodeling of the adjacent skull base, such as expansion of the IAC by vestibular schwannomas and expansion of the facial canal by facial schwannomas. Expansion of the jugular foramen by CN IX, CN X, or CN XI schwannomas can also be seen. See the image below. Computed tomography scan through the skull base shows soft-tissue expansion of the facial nerve canal in the petrous bone (arrow). Thin-collimation CT imaging of the skull base can be helpful in evaluating bone destruction. This finding is useful in differentiating jugular foramen schwannomas from paragangliomas. See the image below. Glomus jugulare. Axial computed tomography scan obtained through the skull base shows extensive bone destruction (arrows), unlike the smooth expansion seen with schwannomas. With CT scanning, large lesions can be diagnosed with a high degree of confidence. However, distinguishing a schwannoma from a meningioma may not be possible by using CT scanning. A small lesion that affects a CN cannot be confidently excluded. CT findings can be false-negative in small lesions. Occasionally, a false-positive diagnosis occurs because a streak artifact in the cerebellopontine angle cistern mimics a lesion. 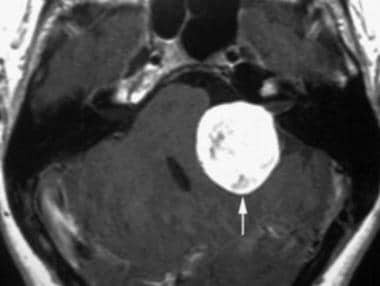 Similar to CT imaging, MRI tends to depict schwannomas as homogeneous masses. [7, 13, 14, 25, 7, 27, 5] Schwannomas are typically isointense or slightly hypointense relative to gray matter on T1-weighted images and slightly hypointense to CSF on T2-weighted images. Gadolinium enhancement is typically homogeneous, although larger schwannomas can show areas of cystic degeneration and heterogeneous signal intensity; these findings are based on increased numbers of areas with Antoni type B histologic features. High-resolution, thin-section, heavily T2-weighted, 3-dimensional (3-D) sequences have been used to look for acoustic neuromas. On images obtained with these sequences, individual nerves in the cistern and internal auditory canal (IAC) can be visualized as linear filling defects in the bright CSF. Small masses can be identified without the use of an intravenously administered contrast agent. See the image below. Occasionally, tumors can be entirely intracanicular, in which case the primary differential diagnosis is a meningioma of the CPA. Unlike vestibular schwannomas, meningiomas tend to form obtuse angles with the adjacent petrous bone, are typically hemispheric, and often extend into the middle fossa as a result of herniation. Meningiomas can be differentiated by their broad base of attachment along the petrous bone and by the presence of a dural tail. Meningiomas uncommonly extend into the IAC. See the image below. Schwannomas of the facial nerve can occur along any segment, but they frequently involve the geniculate ganglion and extend proximally or distally from there. MRI and CT imaging characteristics are similar to those of vestibular schwannomas. The location of the mass results in variable growth patterns. In the IAC, facial schwannomas are indistinguishable from vestibular lesions. When facial schwannomas cross the petrous bone to involve both the middle and posterior fossa, they cross in the mid portion of the petrous bone. 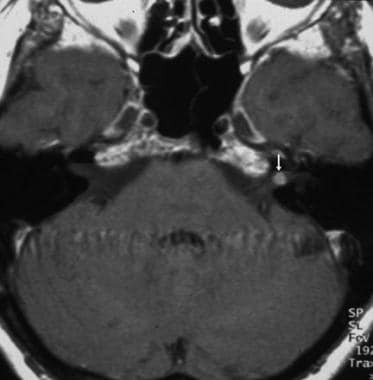 In contrast, trigeminal schwannomas cross near the petrous apex. Lesions in the geniculate ganglion can be mistaken for temporal lobe lesions, and imaging in the coronal plane is useful in evaluating the lesions. See the images below. Facial schwannoma. Axial T1-weighted magnetic resonance image at the level of the internal auditory canal shows a soft-tissue mass (arrow) along the course of the tympanic segment of the facial nerve. Facial schwannoma. 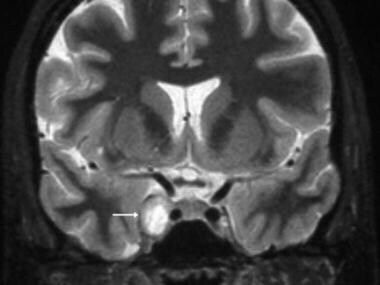 Coronal contrast-enhanced T1-weighted magnetic resonance image shows a schwannoma (arrow) involving the mastoid segment of cranial nerve VII. 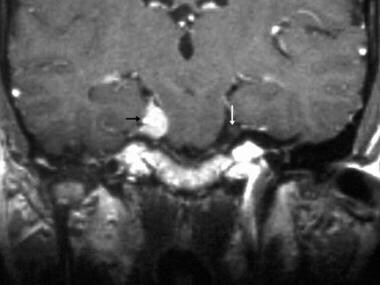 Trigeminal schwannomas can arise in the Meckel cave or in the cistern along the course of the nerve. Extension and expansion of the foramen rotundum or ovale is common, and the masses can have a bilobed appearance. Tumors can also grow posteriorly to involve the posterior fossa, or they can grow anteriorly into the cavernous sinus. Trigeminal schwannomas tend to have a more cystic component than other schwannomas. See the images below. Trigeminal schwannoma. Coronal T2-weighted magnetic resonance image shows a hyperintense mass in the right cavernous sinus (arrow). Trigeminal schwannoma. 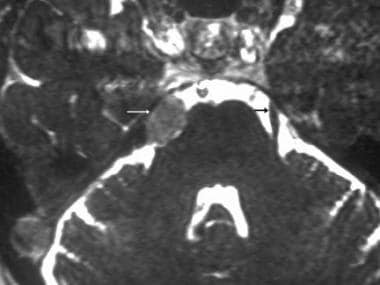 Axial contrast-enhanced T1-weighted magnetic resonance image at the level of the mid pons shows a strongly enhancing mass involving the left cranial nerve V in the cistern (black arrow) and Meckel cave (white arrow). Trigeminal schwannoma. Axial constructive interference in the steady state (CISS) magnetic resonance image shows a mass in the region of the cisternal segment of the right cranial nerve V (white arrow). The left cranial nerve V without tumor (black arrow) is also depicted. Trigeminal schwannoma. Coronal contrast-enhanced T1-weighted magnetic resonance image shows the mass arising from the cisternal segment of the right cranial nerve V. The left cranial nerve V (without tumor) is also shown (arrow). Glossopharyngeal, vagus, or accessory nerve schwannomas are rare and difficult to distinguish from one another. The tumors are classified on the basis of their growth patterns: Type A lesions grow predominantly intracranially, type B lesions grow predominantly at the jugular foramen, and type C lesions grow predominantly extracranially. CT scan and MRI characteristics are similar to those of other schwannomas. In contrast to the more common paragangliomas in this region, schwannomas expand but do not infiltrate the adjacent bone. Unlike paragangliomas, which infiltrate and erode adjacent bone, schwannomas smoothly expand the bone and leave an intact cortical margin. See the images below. Glossopharyngeal schwannoma. 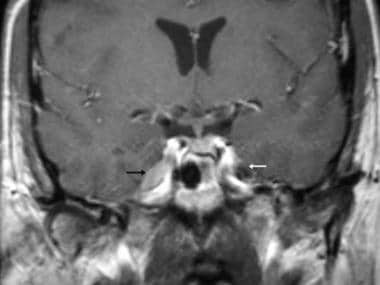 Axial contrast-enhanced T1-weighted magnetic resonance image shows a large extra-axial mass that compresses the brainstem (black arrows) and extends into the skull base (white arrows). Glossopharyngeal schwannoma. 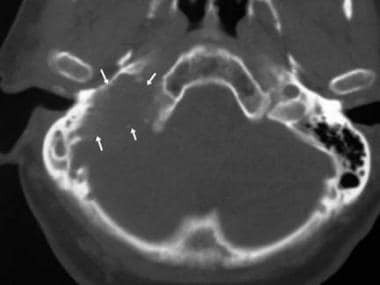 Coronal contrast-enhanced T1-weighted magnetic resonance image shows a mass (arrows) extending through the skull base via the jugular foramen. Schwannomas of the abducens nerve (ie, CN VI) are rare. They are reported to occur in the prepontine cistern, with a heterogeneous appearance on CT scans and MRIs and extension into the adjacent cavernous sinus. As with other schwannomas, meningioma is the primary differential diagnosis, and the presence of areas of cystic change (which have high signal intensity on T2-weighted images) can suggest the likelihood of schwannoma instead of meningioma. Similarly, CN IV schwannomas are rare. See the image below. Cranial nerve IV schwannoma. Axial and coronal contrast-enhanced T1-weighted magnetic resonance images demonstrate a small mass (arrows) involving the cisternal segment of cranial nerve IV adjacent to the midbrain. Courtesy of Glenn A Tung, MD, Brown Medical School. 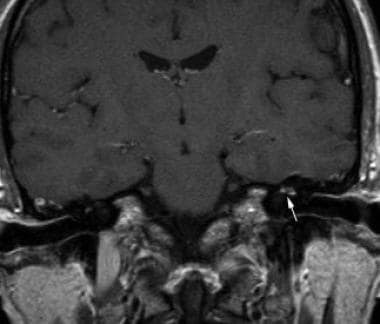 Schwannomas of the oculomotor nerve are reported in the literature, but they are exceedingly rare. The tumors can present as masses in the suprasellar cistern, and they can be difficult to distinguish from meningiomas in this region. Gadolinium-based contrast agents have been linked to the development of nephrogenic systemic fibrosis (NSF) or nephrogenic fibrosing dermopathy (NFD). For more information, see Nephrogenic Systemic Fibrosis. 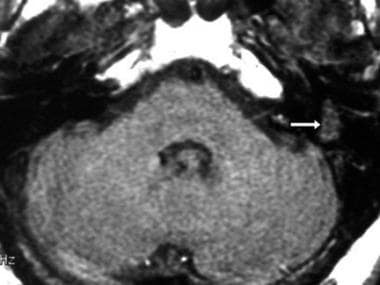 The disease has occurred in patients with moderate to end-stage renal disease after being given a gadolinium-based contrast agent to enhance MRI or MRA scans. NSF/NFD is a debilitating and sometimes fatal disease. Characteristics include red or dark patches on the skin; burning, itching, swelling, hardening, and tightening of the skin; yellow spots on the whites of the eyes; joint stiffness with trouble moving or straightening the arms, hands, legs, or feet; pain deep in the hip bones or ribs; and muscle weakness. For more information, see the FDA Public Health Advisory or Medscape. A diagnosis of a CN mass can be made with a high degree of confidence by using MRI. False-positive findings occur primarily in the jugular fossa, where slow flow in the jugular bulb can mimic a mass. A false-negative diagnosis can occur if imaging is inadequate—for example, if the image sections are too thick or if fat suppression is not used in evaluating the skull base. 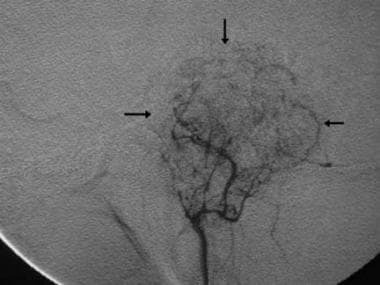 Angiography is not used as a diagnostic modality for schwannomas. However, when studied with angiography, schwannomas typically appear hypovascular; this finding distinguishes them from paragangliomas when the lesion is in the jugular fossa. See the images below. Glossopharyngeal schwannoma. 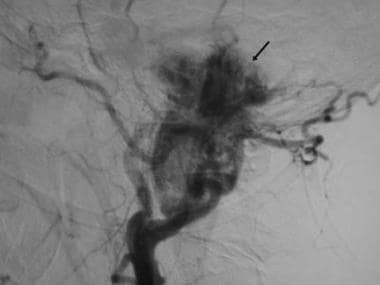 Digital subtraction angiogram obtained with an ascending pharyngeal arterial injection reveals a moderately hypervascular schwannoma (arrows), which is atypical for schwannomas. Glomus jugulare. Digital subtraction angiogram shows a markedly hypervascular mass (arrow). Sarrazin JL, Toulgoat F, Benoudiba F. The lower cranial nerves: IX, X, XI, XII. Diagn Interv Imaging. 2013 Jul 31. [Medline]. Thompson AL, Aviv RI, Chen JM, Nedzelski JM, Yuen HW, Fox AJ, et al. Magnetic resonance imaging of facial nerve schwannoma. Laryngoscope. 2009 Dec. 119(12):2428-36. [Medline]. Badar Z, Farooq Z, Zaccarini D, Ezhapilli SR. Tongue base schwannoma: differential diagnosis and imaging features with a case presentation. Radiol Case Rep. 2016 Dec. 11 (4):336-340. [Medline]. Skolnik AD, Loevner LA, Sampathu DM, Newman JG, Lee JY, Bagley LJ, et al. Cranial Nerve Schwannomas: Diagnostic Imaging Approach. Radiographics. 2016 Sep-Oct. 36 (5):1463-77. [Medline]. Coelho DH, Tang Y, Suddarth B, Mamdani M. MRI surveillance of vestibular schwannomas without contrast enhancement: Clinical and economic evaluation. Laryngoscope. 2017 Apr 11. [Medline]. Spilberg G, Marchiori E, Gasparetto EL, Cabral RF, Takayassu TC, Batista RR, et al. Magnetic resonance findings of neurofibromatosis type 2: a case report. Cases J. 2009 Jul 2. 2:6720. [Medline]. [Full Text]. Stivaros SM, Stemmer-Rachamimov AO, Alston R, Plotkin SR, Nadol JB, Quesnel A, et al. Multiple synchronous sites of origin of vestibular schwannomas in neurofibromatosis Type 2. J Med Genet. 2015 Aug. 52 (8):557-62. [Medline]. Wilson-Pauwels L, Akesson EJ, Stewart PA. Cranial Nerves: Anatomy and Clinical Comments. Decker BC. 1998. Yuh WT, Wright DC, Barloon TJ, et al. MR imaging of primary tumors of trigeminal nerve and Meckel''s cave. AJR Am J Roentgenol. 1988 Sep. 151(3):577-82. [Medline]. Weissman JL. Hearing loss. Radiology. 1996 Jun. 199(3):593-611. [Medline]. Ganesan P, Sankaran P, Kothandaraman PP. A Rare Case of Hearing Impairment due to Cerebello-Pontine Angle Lesion: Trigeminal Schwannoma. J Int Adv Otol. 2015 Aug. 11 (2):170-2. [Medline]. Agarwal A. Intracranial trigeminal schwannoma. Neuroradiol J. 2015 Feb. 28 (1):36-41. [Medline]. Atlas S, ed. Magnetic Resonance Imaging of the Brain and Spine. 2nd ed. Lippincott-Raven. 1996:781-6. Schmalbrock P, Chakeres DW, Monroe JW, et al. Assessment of internal auditory canal tumors: a comparison of contrast- enhanced T1-weighted and steady-state T2-weighted gradient-echo MR imaging. AJNR Am J Neuroradiol. 1999 Aug. 20(7):1207-13. [Medline]. 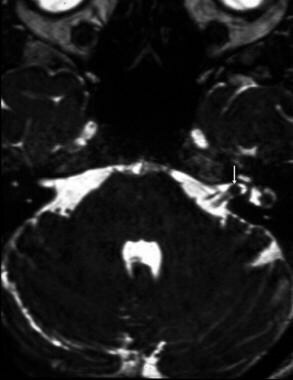 Gagliardo C, Martines F, Bencivinni F, La Tona G, Lo Casto A, Midiri M. Intratumoral haemorrhage causing an unusual clinical presentation of a vestibular schwannoma. Neuroradiol J. 2013 Feb. 26(1):30-4. [Medline]. Durnford AJ, Harrisson SE, Ditchfield A, Shenouda E. Spontaneous regression of a cystic hypoglossal schwannoma causing unilateral tongue atrophy. Br J Neurosurg. 2013 Jul 15. [Medline]. Chung SY, Kim DI, Lee BH, et al. Facial nerve schwannomas: CT and MR findings. Yonsei Med J. 1998 Apr. 39(2):148-53. [Medline]. Behuria S, Rout TK, Pattanayak S. Diagnosis and management of schwannomas originating from the cervical vagus nerve. Ann R Coll Surg Engl. 2015 Mar. 97 (2):92-7. [Medline]. Bittencourt AG, Alves RD, Ikari LS, Burke PR, Gebrim EM, Bento RF. 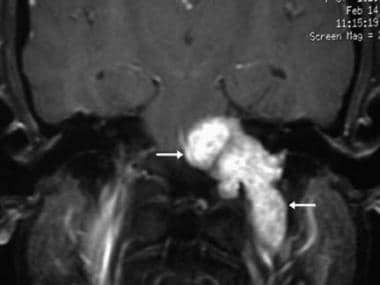 Intracochlear schwannoma: diagnosis and management. Int Arch Otorhinolaryngol. 2014 Jul. 18 (3):322-4. [Medline]. Bennett M, Haynes DS. Surgical approaches and complications in the removal of vestibular schwannomas. Otolaryngol Clin North Am. 2007 Jun. 40(3):589-609, ix-x. [Medline]. Backous DD, Pham HT. Guiding patients through the choices for treating vestibular schwannomas: balancing options and ensuring informed consent. Otolaryngol Clin North Am. 2007 Jun. 40(3):521-40, viii-ix. [Medline]. Kabil MS, Shahinian HK. A series of 112 fully endoscopic resections of vestibular schwannomas. Minim Invasive Neurosurg. 2006 Dec. 49(6):362-8. [Medline]. Lobato-Polo J, Kondziolka D, Zorro O, Kano H, Flickinger JC, Lunsford LD. Gamma knife radiosurgery in younger patients with vestibular schwannomas. Neurosurgery. 2009 Aug. 65(2):294-300; discussion 300-1. [Medline]. Nishioka K, Abo D, Aoyama H, Furuta Y, Onimaru R, Onodera S, et al. Stereotactic radiotherapy for intracranial nonacoustic schwannomas including facial nerve schwannoma. Int J Radiat Oncol Biol Phys. 2009 Dec 1. 75(5):1415-9. [Medline]. Shin RK, Mejico LJ, Kawasaki A, Purvin VA, Moster ML, Younge BR, et al. Transient ocular motor nerve palsies associated with presumed cranial nerve schwannomas. J Neuroophthalmol. 2015 Jun. 35 (2):139-43. [Medline]. Miller ME, Lin H, Mastrodimos B, Cueva RA. Long-term MRI surveillance after microsurgery for vestibular schwannoma. Laryngoscope. 2017 Mar 14. [Medline]. Colreavy MP, Lacy PD, Hughes J, et al. Head and neck schwannomas--a 10 year review. J Laryngol Otol. 2000 Feb. 114(2):119-24. [Medline]. Gomez Beldarrain M, Fernandez Canton G, Garcia-Monco JC. 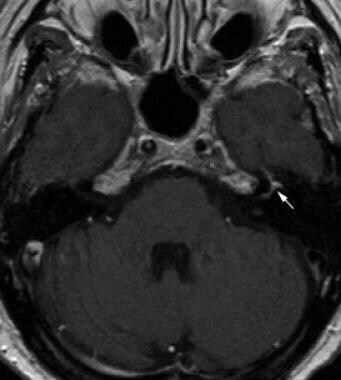 Hypoglossal schwannoma: an uncommon cause of twelfth-nerve palsy. Neurologia. 2000 Apr. 15(4):182-3. [Medline]. Shah N, Sibtain A, Saunders MI, et al. High FDG uptake in a schwannoma: a PET study. J Comput Assist Tomogr. 2000 Jan-Feb. 24(1):55-6. [Medline]. Eldevik OP, Gabrielsen TO, Jacobsen EA. Imaging findings in schwannomas of the jugular foramen. AJNR Am J Neuroradiol. 2000 Jun-Jul. 21(6):1139-44. [Medline]. Ginsberg F, Peyster RG, Rose WS, Drapkin AJ. Sixth nerve schwannoma: MR and CT demonstration. J Comput Assist Tomogr. 1988 May-Jun. 12(3):482-4. [Medline]. Katsumata Y, Maehara T, Noda M, Shirouzu I. Neurinoma of the oculomotor nerve: CT and MR features. J Comput Assist Tomogr. 1990 Jul-Aug. 14(4):658-61. [Medline]. Nakamura M, Krauss JK. Image-guided resection of small lesions in the cavernous sinus and Meckel's cave. Eur J Surg Oncol. 2010 Feb. 36(2):208-13. [Medline]. Extracranial vagal schwannoma. Axial contrast-enhanced computed tomography scan shows a heterogeneous mass (arrow) in the neck posterior to the carotid vessels.